From your home base in historic Antequera, enjoy day trips to Seville, Cordoba, Ronda, and Granada—the gems of Andalusia and the heart of Spain's history, art, and culture. 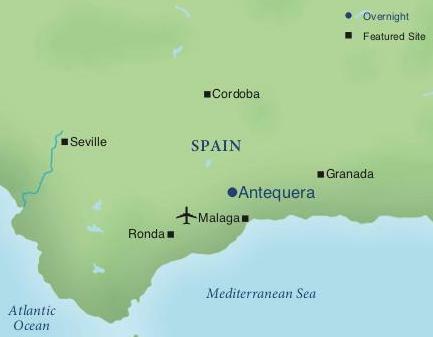 Andalusia, Spain’s historic southern region, owes its name and much of its heritage to eight centuries of Moorish rule. Stemming from the Arabic name Al-Andalus, Andalusia is just one of the thousands of Spanish words with Arabic roots. Explore the influence of Moorish culture on Spanish culture, along with Christian and Jewish influences, during that time. 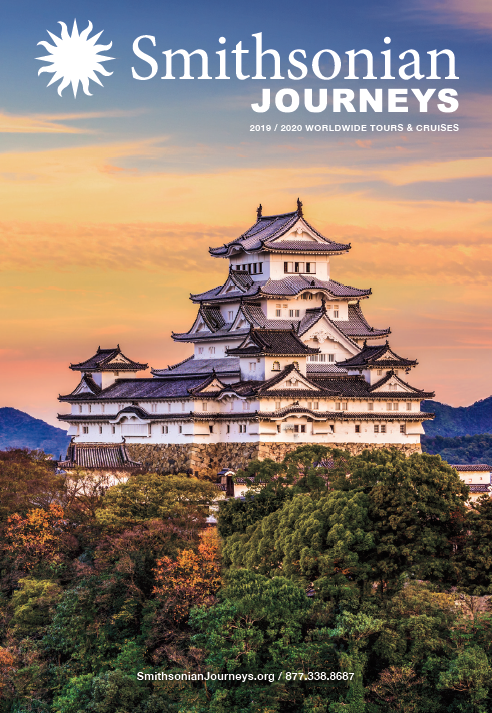 Examine the legacies of these great cultures through Andalusia’s art, architecture, and cuisine while appreciating the region’s contemporary culture. From the Alhambra and the great mosque in Córdoba to the charming town of Ronda and the cultural center of Seville, embrace the best of Andalusia. Antequera: Reside in this classic medieval town, where you’ll visit the largest megalithic tomb in Europe (a World Heritage site), the 14th-century fortress that watches over the city, and some of its 30 churches and cathedrals. Granada: Gaze at the elaborate Moorish design of Granada’s Alhambra, a palace and fortress built by the kings of the Nasrid dynasty who sought to create a paradise on Earth. Visit the breathtaking buildings, courtyards, and gardens and enjoy lunch inside the Alhambra at the Parador de Granada. Seville: Travel to Seville to visit two World Heritage sites: the immense cathedral (the world’s largest Gothic building), and the splendid Alcázar, a 10th-century Moorish palace. Your walking tour also includes the Plaza de España with its magnificent tile work and the charming Barrio de Santa Cruz. Ronda: Dramatically perched on the El Tajo gorge, Ronda is one of the region’s loveliest pueblos blancos, or white towns. Enjoy time to take in this charming city, its panoramic views, and its deep connection to la corrida (bullfighting). Córdoba: Ruled by the Umayyad emirate for centuries, Córdoba was once one of Europe’s most advanced centers of learning. Explore La Mezquita (the great mosque), with its spellbinding Moorish architecture—including 856 columns connected by striped arches—and the cathedral that was built inside during the Reconquista. Plus, experience other important cultural influences in the historic center (a World Heritage site) such as the imposing Roman bridge and the Jewish quarter, home to one of the few remaining synagogues in Spain. Málaga: Take in the art of native son, Pablo Picasso, at the Museo Picasso. Cultural Traditions: Feel the passionate music and dance of flamenco at a special performance and savor the region’s culinary specialties, including a wine tasting. Depart the U.S. for Malaga, Spain via overnight trans-Atlantic air service. After clearing customs at Malaga’s Costa del Sol Airport depart for the short drive to Antequera. Check-in to the Parador de Antequera. Start each morning with a hearty buffet breakfast at the hotel. Excursion: This morning journey just outside Antequera to a complex of ancient megalithic tombs, Menga Dolmen and Viera Dolmen. Designated as a World Heritage Site in 2016, the site is over 5,000 years old and Menga Dolman is considered to be the largest burial mound in Europe. Continue to the Alcazaba de Antequera and visit the Real Colegiata de Santa Maria la Mayor. Then explore the picturesque cobblestone streets of Antequera, the city of white. Excursion: Enjoy a scenic drive to Granada and discover the magnificent Alhambra, the city’s world-famous Moorish fortress and palace complex. Built during the 13th and 14th centuries, the Alhambra provides remarkable views of the city, sparkling fountains, pools, courtyards, and shady colonnades. Lunch of Mediterranean specialties will be served at the Parador de Granada, formerly a 15th-century monastery on the grounds of the Alhambra. Excursion: Drive to Seville, the cultural heart of southern Spain. Conquered by the Moors in 712, they built the famed Alcazar in 939 that later became a royal residence after the Spanish recaptured the city in 1586. Visit the expansive Plaza de España and see the Plaza de America. Drive along the Guadalquivir River and visit the awe-inspiring Cathedral of Seville, the largest Gothic building in the world. Later, tour the spectacular Alcazar Palace. See the Bullring, the Golden Tower and walk through the colorful Barrio de Santa Cruz, a charming old quarter of flowering balconies, lively fountains and shady medieval lanes. Educational Focus: Enjoy a talk on Spain’s bullfighting traditions. Learn about the history of this national pastime, and particularly its ties to Ronda and southern Spain. Excursion: Later, travel to Ronda, one of Spain’s oldest and most remarkable towns, that sits atop a massive cliff. Its twisting streets and lanes reveal architecture influenced by centuries of Moorish influence. Step into the Iglesia de Santa María la Mayor, a church commissioned by Ferdinand and Isabella in 1485. The church was built on the site of a mosque and wasn’t completed until the 17th century, so the architecture combines Gothic, Renaissance, and baroque elements as well as vestiges of its Moorish beginnings. Also visit the Plaza de Toros, one of Spain’s finest, and the Casa Don Bosco. Local Favor: After exploring Ronda, visit the Bodega Joaquim Fernandez for a wine-tasting and lunch. Excursion: After breakfast, set out for the fascinating city of Cordoba, originally a Roman settlement that was conquered by the Moors in the 8th century. Later, it was recaptured by the armies of Castile during the Reconquista. Visit La Mezquita, a former mosque, which in its day was only rivaled by the Grand Mosque in Mecca. See the Roman Bridge, that spans the Guadalquivir River, and discover the Old Town and Jewish Quarter, designated a World Heritage site. Independent Exploration: Lunch is at leisure with time to discover Cordoba on your own before returning to Antequera. Educational Focus: Contemporary Spain. Discuss the current issues affecting life in Spain. Excursion: A short ride takes you to Malaga, a city currently undergoing a renaissance in the development of culture and the arts. Take a guided tour of the Museo Picasso Malaga, dedicated to the artist in the city of his birth. With a remarkable collection of work from the arc of Picasso’s various periods, the museum showcases them in chronological order so visitors get a sense of how this world-famous artist developed over the years. Independently Exploration: Enjoy lunch independently with time to explore Malaga on your own.